Naomi Atkin had heard all about the opioid crisis. For the last three years, the 22-year-old volunteered with harm reduction organizations in Toronto. Among her responsibilities was attending concerts and raves to provide a safe support system to anyone who might have been experiencing a bad drug trip. However, it wasn’t until this summer when her former boyfriend died of a heroin overdose, that the epidemic took on a new meaning for her. “I’d never been personally affected by it before and had someone actually die,” Atkin said. Thousands of lives have been lost in Canada because of opioid-related overdoses, spiking in the 2000s with an increase in abuse of prescription and recreational oxycodone, according to the Globe and Mail. While Oxycontin—the brand-name version of oxycodone—was removed from the pharmaceutical market in 2012, other opioids such as fentanyl and carfentanil have kept overdose rates high. 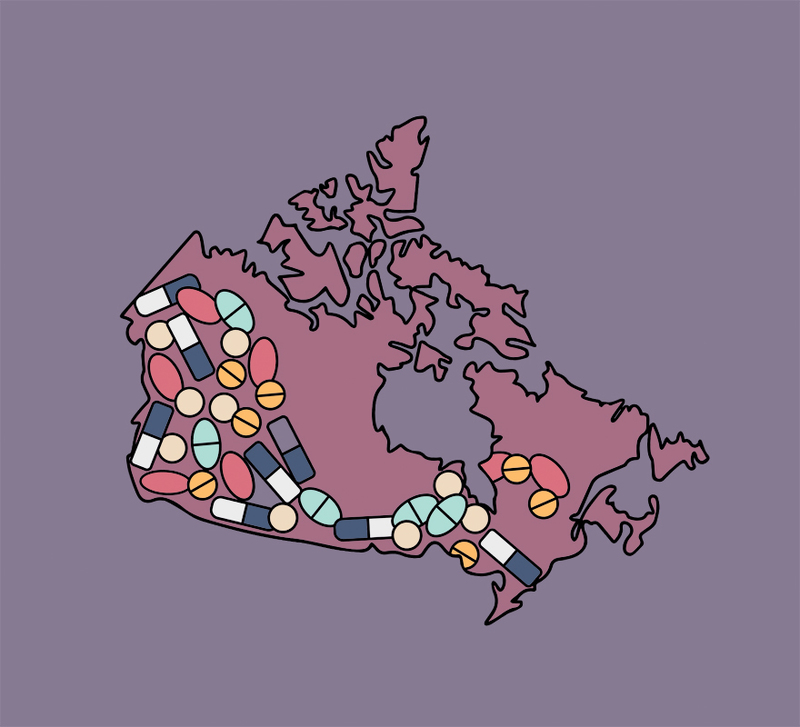 Atkin’s home province of Ontario reported the second highest number of opioid-related deaths between January 2016 and March 2017, according to federal government statistics. This number, 865, was topped only by British Columbia, the province often deemed ground zero of Canada’s recent opioid epidemic. In April 2016, the province declared a public health emergency following a heightened number of fatal overdoses. The number of opioid-related deaths in British Columbia was higher in the first six months of 2017 than it had been in that same time frame the year before. However, June saw the lowest number of deaths in 2017 in the province up to that point—a total of 111, which amounts to just under four deaths per day, according to the CBC. Despite the decrease in June, the presence of fentanyl in other illicit substances has accounted for an overall increase in drug overdoses in B.C. since 2012, according to the B.C. Coroners Service. Fentanyl is a potent opioid pain medication typically available by prescription as a patch and about 100 times more powerful than heroin. However, it is no longer the strongest opioid being mixed with other drugs. Carfentanil—which is about 100 times more potent than fentanyl—was first detected on the streets of Vancouver in November 2016, according to the Vancouver Sun. A month later, Health Canada confirmed the opioid was found in Ontario, manufactured to resemble green Oxycontin pills. As little as 20 micrograms of carfentanil can be lethal—a little less than a pinch of salt, according to the Alberta RCMP. In August 2016, the Calgary Police Service, the RCMP and the Canada Border Services Agency confiscated one kilogram of carfentanil at Vancouver Airport. The confiscated batch would have been enough to create 50 million deadly doses, according to the RCMP. Between September 2016 and June 2017, carfentanil was reported in Manitoba, Alberta, Ontario, Nova Scotia and in a Saskatchewan penitentiary, according to the CBC. While carfentanil has yet to be detected on the streets of Montreal, Global News reported that 209 grams of the substance were seized at the Montreal-Mirabel airport in January. Of these two opioids, fentanyl remains the most commonly found in Canada. According to an investigation by The Globe and Mail, black market fentanyl is being manufactured in China and illegally smuggled across the Canadian border in packages weighing less than 30 grams—below the legal weight of a package border guards can open without the consent of the recipient. Fentanyl’s low cost and high potency allows drug dealers to spend less and earn more if they cut the opioid into other drugs, most commonly heroin, to heighten their effects. Across the country, there was a 40 per cent increase in street drugs testing positive for fentanyl, Global News reported in October 2016. According to the CBC, there have been cases in Montreal of fentanyl being found in cocaine, MDMA (molly or ecstasy) and PCP, among other illicit substances. According to Dr. Warren Steiner, who obtained his degree from McGill and has been practicing psychiatry since 1988, many of Canada’s opioid users originally got hooked on prescription painkillers. “Doctors, as a group, over the last 10 to 20 years, have been very irresponsible in their use of prescription [opioid] painkillers, and that led to a big part of this,” said Steiner, who has been employed at the Montreal-based private rehab centre 360 DTX since its opening in 2014. Over-prescription of opioids facilitated the development of addiction among many patients, Steiner said. “Then you progress from the regular prescriptions—you start buying from the street, and you go up the ladder to the more and more potent drugs,” he added. Regardless of the origins of such substance abuse, a key factor in the current opioid crisis is the frequency with which fentanyl and carfentanil end up mixed with other drugs. Based on the stories Atkin has heard, it is something she said can happen more often than most expect. Atkin recently began volunteering at a pop-up safe injection site in Moss Park in downtown Toronto because she wanted to be more involved in preventing fatal overdoses. “I think that nothing good comes to people who are using heroin because it’s just so dangerous—especially now,” she said. “I saw someone overdosing on the street just a few weeks ago.” Although she had a naloxone kit with her—the opioid overdose antidote—an ambulance arrived before she needed to use it. Cold, clammy skin. A limp body, seemingly deep in sleep. Slow breathing. A faltering or halted heartbeat. These are the symptoms of an overdose. Imagine you and your friends are sitting around a coffee table snorting cocaine. A mid-party upper to boost your energy perhaps. You start off small, to test your tolerance. Your friend, on the other hand, snorts a larger line. Following that bump, your friend sinks back into the couch, looking dopey or at least quite out of it. They become unresponsive and look as if they’re settling into a deep sleep. They may begin snoring or choking, their fingernails or skin may turn blue, their pupils may grow small or their eyes will begin to roll back. Not only is it important to know that these are not the typical effects of cocaine use, it could also be life-saving to know that these signs are likely indicative of fentanyl or carfentanil contamination. Death caused by an overdose can happen within minutes of ingesting the drug, although it often happens up to a few hours later after the user has fallen into a deep sleep. Nonetheless, overdoses need to be handled swiftly. In a scenario like the one described above, call 911 immediately. Someone should check the person’s breathing—if it’s slow or shallow, inject naloxone to regulate their breathing. If naloxone is not available, administer CPR to help the person breathe until first responders arrive. If you incorrectly assess an overdose and inject naloxone, it will not harm the person, as naloxone does not induce a high—it only blocks effects of other opioids to the brain. “A death from an opiate overdose is really someone falling asleep, losing consciousness and getting into a very deep sleep where they can’t wake up, even though they should feel the need to breath—they stop breathing and they die from that,” according to Steiner. As Gosselin explained, when the brain does not have enough oxygen it strokes out and your heart starts to give out––sometimes the user will stop breathing all together. Although there are three categories of opioids—natural, synthetic and semi-synthetic—the effects these drugs have on the brain are the same. They all bind to opiate receptors in the brain. The difference is the degree in strength of each opioid. Natural opiates, such as codeine and morphine, are commonly used to alleviate pain and accompany a variety of medical procedures. “Those activate the opiate system very mildly,” Steiner said, adding that these drugs activate only about five per cent of a person’s opiate receptors. The municipal government has been taking precautions over the last few months in preparation for a predicted influx of opiate overdoses. Safe injection sites were introduced at the beginning of the summer and, in September, the city announced an initiative to make naloxone more accessible. Safe injection sites provide a space for users to inject drugs and, if there is a medical emergency, a healthcare worker employed at the site can attend to the person. Two safe injection sites opened in Montreal in June: Dopamine in Hochelaga-Maisonneuve and Cactus in downtown Montreal. “For us, it has been a nine-year battle to open this site in our facility,” said Martin Pagé, the director of Dopamine. Pagé said another safe injection site is set to open in the Centre-Sud neighbourhood this fall. Once all three sites are open to the public, they are estimated to provide service for a total of 200 to 300 drug injections per day, according to Montreal Gazette. After the centres close for the day—Dopamine closes at 1 a.m. and Cactus at 4 a.m.—a van drives around Montreal offering a mobile safe injection space. The service is called Spectre de Rue. Safe injection sites exist in Vancouver, with plans to open others in Surrey and Victoria have been approved by the federal government. Ottawa opened its first safe injection site on Sept. 26 and Toronto currently has a pop-up site in Moss Park. On Sept. 5, Mayor Denis Coderre announced a pilot project to supply police officers and firefighters in certain boroughs with naloxone kits and training to use the antidote, according to the CBC. Access to naloxone has been scarce in Montreal, as only four pharmacies in the city carry the antidote, according to the National Observer. Additionally, proper training on how to administer naloxone has been limited to first responders, community workers and staff at the city’s safe injection sites. Safe injection sites provide the community with greater access to naloxone. However, some, like Pagé, believe there needs to be greater access outside of these sites.